Alastair Cook, former captain of England’s national cricket team has decided to retire from international cricket after the fifth and final match against India at the Oval, starting September 7, 2018. Cook took over as captain from Andrew Strauss in 2012 and England went on to win 24 Tests under his charge. Alastair Cook, former captain of England’s national cricket team has decided to retire from international cricket after the fifth and final match against India at the Oval, starting September 7, 2018. Announcing his retirement, the cricketer said, "Although it is a sad day, I can do so with a big smile on my face knowing I have given everything and there is nothing left in the tank. I have achieved more than I could have ever imagined and feel very privileged to have played for such a long time alongside some of the greats of the English game.” He, however, said that he would miss the dressing room environment. The 33-year-old is known as one of England’s greatest test players. He is also the highest run-scorer for the nation in tests and stands 6th on the all-time list of Test run-scorers, after Sachin Tendulkar, Ricky Ponting, Jacques Kallis, Rahul Dravid and Kumar Sangakkara. However, this latest series against India has not been one of his best, as he managed to score only 109 runs in seven innings, which were spread across four Test matches. Due to his falling form, his place in the test side was also under scanner. • Alastair Cook, the left-hander made his Test debut at the age of 21, replacing Michael Vaughan against India at Nagpur in 2006, and hit an unbeaten century in the second innings. • He missed the third match of that series because of illness but has made a record 158 consecutive Test appearances since. • In total, Cook has played 161 tests and scored 12,254 runs at an average of 44.88, which includes 32 hundreds and 56 half centuries. His highest test score of 294 came against India at Birmingham during the 2011 series. • As an opener, he made a record 11,627 runs. In fact, he formed a great opening partnership with Strauss, scoring a combined 4,711 runs in 117 innings between 2006 and 2012, which is the most by an England opening pair and third-most overall. Following Strauss' retirement in 2012, Cook had 12 different opening partners. • He also scored 3,204 runs at an average of 36.40 in 92 one-day internationals but has not played since 2014. He made four Twenty20 appearances for England. • Cook took over as captain from Andrew Strauss in 2012 and England went on to win 24 Tests under his charge. 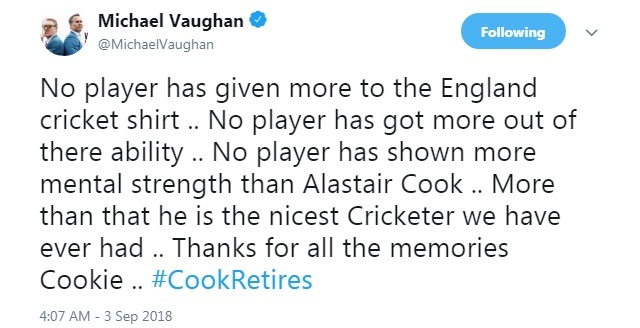 Only Michael Vaughan has more with 26, although Cook lost a record 22 Tests as skipper. • In 2012, Cook led England to their first victory in India for 27 years. England also won two Ashes series with him as the captain, at home in 2013 and 2015, but faced a complete whitewash by 5-0 down under in 2013-14. • In 2016, Cook became the first England batsman to reach 10,000 Test runs, although England lost 4-0 to India in the same year and he resigned as captain in February 2017. Cook has been struggling with his form since the past year. While he hit 243 against West Indies at Edgbaston last summer, he went through another lean spell before making an unbeaten 244 against Australia in the Boxing Day Test, his fifth double century. However, he has passed 50 just once in 16 innings since then.